Thank you 1 768 contributors! We haven’t re-invented the wheel, we simply follow the cash. Most businesses think the Blockchain will “disrupt” their economy. Think again. The reality is 87% of them are fantasizing, simply capitalizing on a trend and will do just fine without a token or the Blockchain. Gron Digital is not ‘most businesses’ and we are not a startup in MVP stage. What we are is an experienced executive team utilizing technology and have created the No.1 GRO Smart Wallet. Integrating with leading exchanges to connect multiple sports betting + gambling content providers, trusted world-class operators and quality players. Winnings are credited easily. Token withdrawal is secure. No third-party involvement. All on the Blockchain with Smart Contracts. We have taken what others see as an opportunity in a multi-billion Dollar industry, and made it a reality. Soft Cap 1200 ETH reached. Limited offer with 30% Bonus. Where do you find a casino selling $1 chip for 71 cents? Limited offer with 20% Bonus. Where do you find a casino selling $1 chip for 71 cents? Limited offer with 10% Bonus. Where do you find a casino selling $1 chip for 71 cents? Common industry problems the Operators (Bookmakers/Casinos online) and Players (the consumers of the services) are faced with. Gron Digital has a solution. Players need to have an approved account with every operator to access their funds. 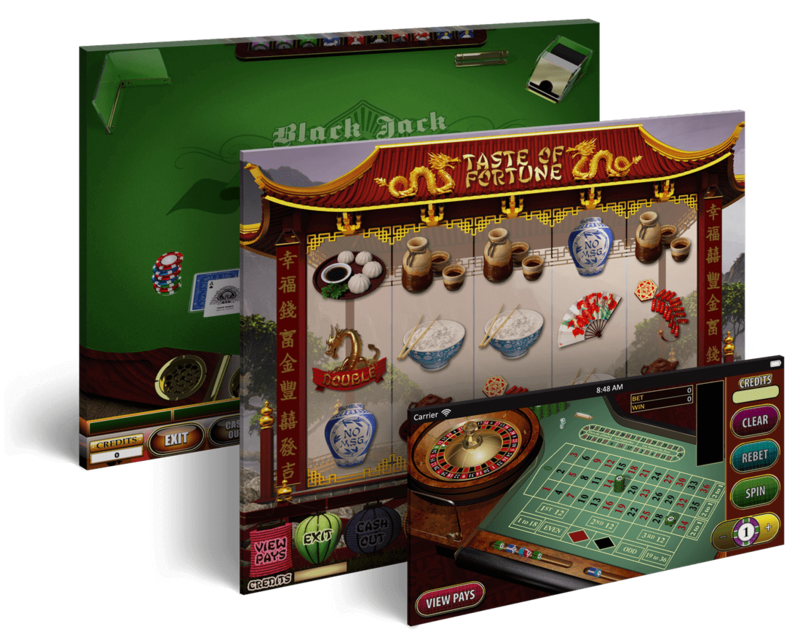 Withdrawing and depositing funds can be a problem with difficult processes in place which interrupts play time in the casino. Who wants to wait a few hours or days for a lucky hot offer? With no direct access to Player’s Liability Accounts, where collective players funds are saved, large payouts become problematic. Is it worth risking your reputation? With Gron Wallet, a player funds the gaming transactions with a choice of options, i.e. credit card, bank transfer, crypto exchanges and controls the fund levels at all times. 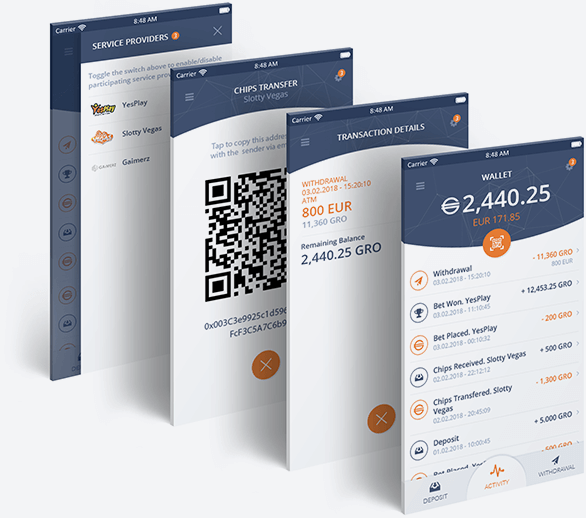 Gron Digital ensures the winnings and gives operators indirect access to a bigger Player's liability account by providing a decentralized ledger and Bank Rollers funds. Gron Digital Smart contract ensures and controls the tight and verifiable payout of the winnings. Players playing at more than one casino or sports betting site often need to submit the same KYC/FICA documents over and over to each operator. Time-consuming and delayed KYC/FICA administration is something operators want to avoid. Gron Digital manages the KYC/FICA process using technology, the Blockchain and third-party collection and verifications so that players only need send their details once. Operators conditions are fulfilled by getting the right player details, these are provided with permission from the player. In some cases, players can experience delays in receiving payouts from trusted smaller operators for a number of reasons. Some operators take time to investigate player queries and may request more information to process payouts. Getting Regulators involved is the last resort and is no longer necessary when the Gron Smart contract is in place. This makes sure that players receive their winnings easily. Smaller operators no longer have to battle with cash reserves needed for Player's Liability Account. These limitations can cause delays for larger payouts needing assistance with lowering entry-level and maximizing cash flow. Gron Digital Smart Contract solves both of these problems and acts as an autonomous agent utilizing cryptographically verified code executed on the Blockchain so that winnings are insured, guaranteed and paid instantly. Let Gron Digital do the work with easy-to-audit and transparent transactions. Exposure of credit card and identity details to many operators puts a player at high risk of being defrauded and not recovering the funds. High payment solution provider costs, lengthy administration, manual checks and chargebacks still happen often, wasting time and money taking away from profits. Gron Digital keeps it simple. No Chargebacks. Low transaction costs. Instant withdrawals. Due to the long processes needed to control abusive and illicit activities, honest players don’t get to enjoy bonuses and promotions which they deserve. Keeping track of player behavior to assist in managing the effects of abuse is important as misuse of bonuses and “sure bet” situations continue to be a reality for casinos and bookmakers. In most cases, the “learning curve” comes at a high cost to an Operator. The Gron Digital platform facilitates the tracking of players with Machine Learning and Artificial Intelligence without compromising the privacy of Players. Operators can be alerted to unwelcome Players to protect their business from unwanted behavior. The success and growth potential of any utility token relies on having a crypto wallet that is easy and safe to use. Our Gron Wallet gives you this security, with the ability to send, receive and store your tokens, where you keep track of your transactions. Our Gron Wallet is seamlessly used with multiple sports betting and gambling content providers, protecting your credit card details and other sensitive information - thanks to the cohesive integration with leading exchanges. 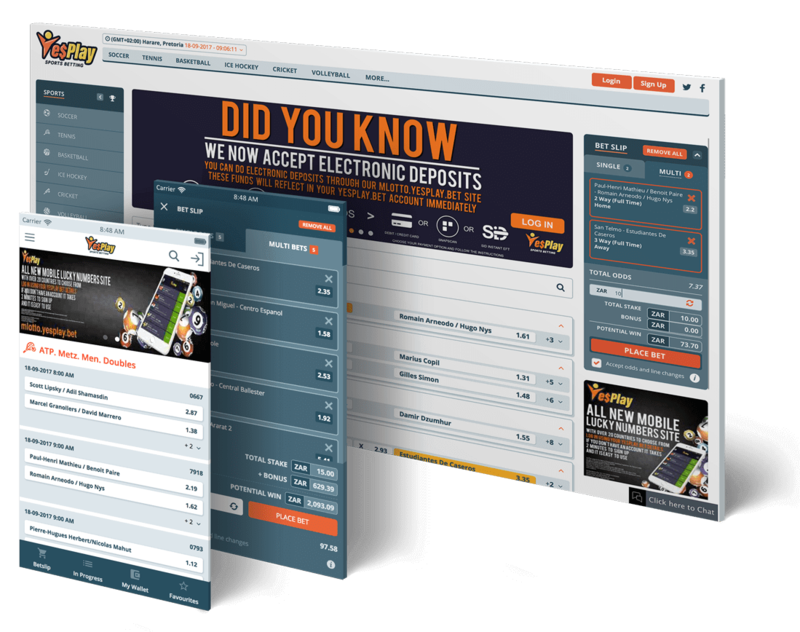 All winnings are credited to your wallet instantly with no third-party involvement. Simply withdraw tokens from your secure wallet, at your convenience. Hire Gron Digital or community developers in order to create your very own Gambling and Betting portal. Gron Digital offers you a variety of pre-built open source modules and tools to make your dreams a reality. Gambling and Betting is one of the most lucrative spaces on the net. At Gron Digital we have lowered the entry level to the industry. Learn how you can have your share in the Gaming sector by reading our Whitepaper. Regardless of whether you are a bookmaker or a punter, you are always the player. What sets you apart from each other is the size of your bankroll, experience and your appetite for taking a risk. The Gron Digital Platform enables peer-to-peer betting, risk sharing, betting exchange and Jackpot-backing. 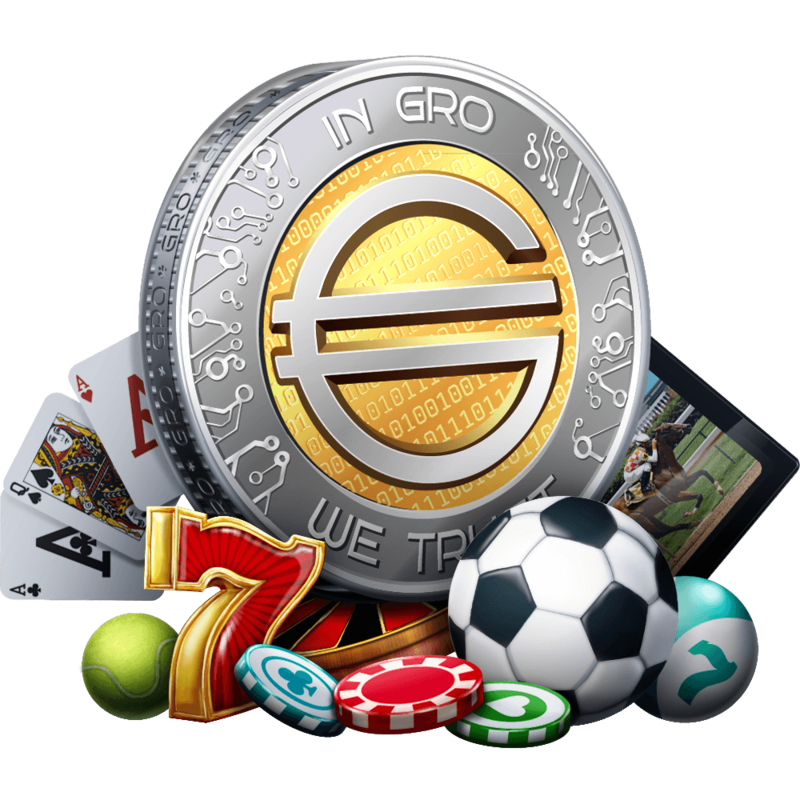 The Gron Digital eco-system caters for all participants within the Gaming sphere. Odds and results providers, live-in-play scouts, developers, regulators, affiliates and risk-backers are a few examples of role players who are rewarded for providing their services. Another element of the online operation is the Affiliation program. The affiliate-operator relationship is complex. Continuity, negative balance carry over and reactivated customer ownership are some of the aspects which can be dealt with efficiently by the Gron Digital Platform. Successful Betting and Gambling operations are dependent on third-party service providers. Reliability and trust come at a high cost to the operator, which often is not justified for a small size entity. With the pay-as-you-use structure, suppliers publish their services on the Gron Digital platform and the Smart Contract takes care of automatic billing. What is the GRO token? Gron Digital appreciates the time-to-market concept. We believe reliable and quality products take time and effort to evolve. An integral part of this process is R&D and customer feedback. 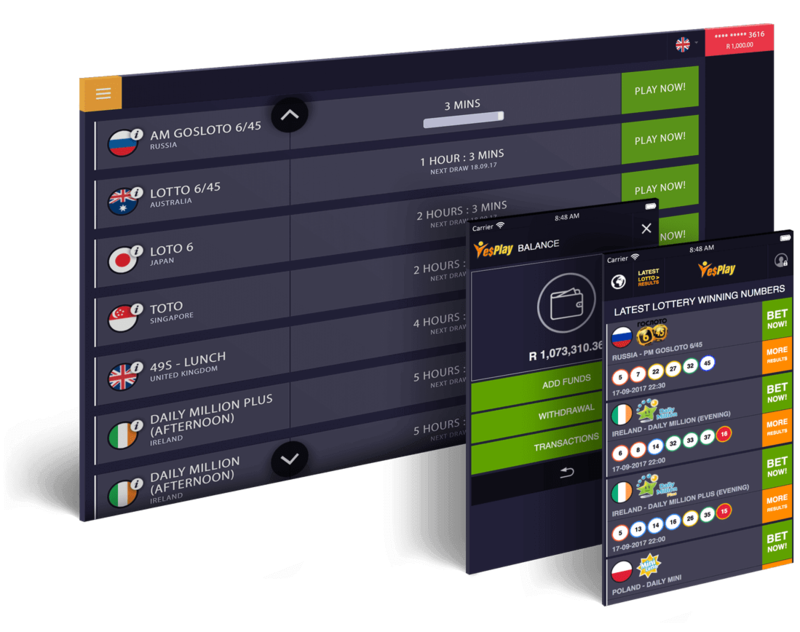 Gron Digital have developed, tested and operated an array of Gaming and Betting products. With more than a decade of Gaming experience, the founders of Gron Digital continue to deliver the essence of every online casino, that is - vibrant and splashy content. The Blockchain is finally ready to adopt more than 200 exciting games. Years of hard work and dedication have yielded a product that is recognized, certified and widely used. A Smart Contract executed on the Blockchain is an ideal candidate in the world of Sports Betting. Pool Betting is yet another black box for consumers, which is now ready to be solved by the Gron Digital Platform. Our Mobile Application and Self-Service Terminals operating across the African continent exist as living proof of robust and reliable products we have to offer. Our journey started in 2012, from proof of concept and MVP, to a fully-fledged and matured product – giving us a 5-year head start. This means that our most time-consuming task is behind us and our vision to bring the Gaming and Betting to the Blockchain is one step away from disrupting this lucrative industry. Limited 30% bonus offer ends 29th March 2018. Limited 20% bonus offer ends 12th April 2018. Limited 10% bonus offer ends 26th April 2018.